When using EndNote and Cite While You Write (CWYW) to manage your references it can be a little tricky to add page numbers into citations in the text. 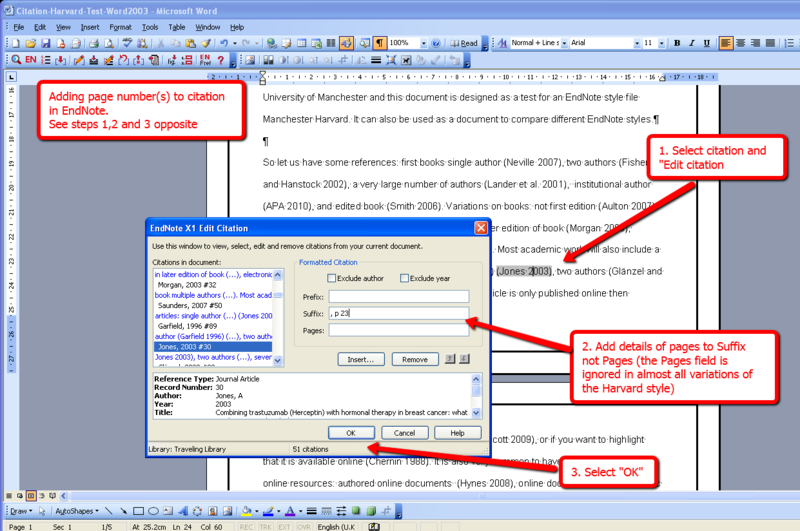 The key is to edit the EndNote citation and include the page number(s), and any punctuation, in the Suffix not Pages field. The EndNote CWYW Edit Citation feature is also used if you want your in text citation to have just the year – just tick the Omit Author checkbox. The Sainsbury Library for Said Business School at Oxford is using delicious. Since EndNote is the reference management software most recommended at University of Manchester, the EndNote tips link is probably the most relevant. However, the delicious bookmarks will be of interest if you want to investigate alternatives. 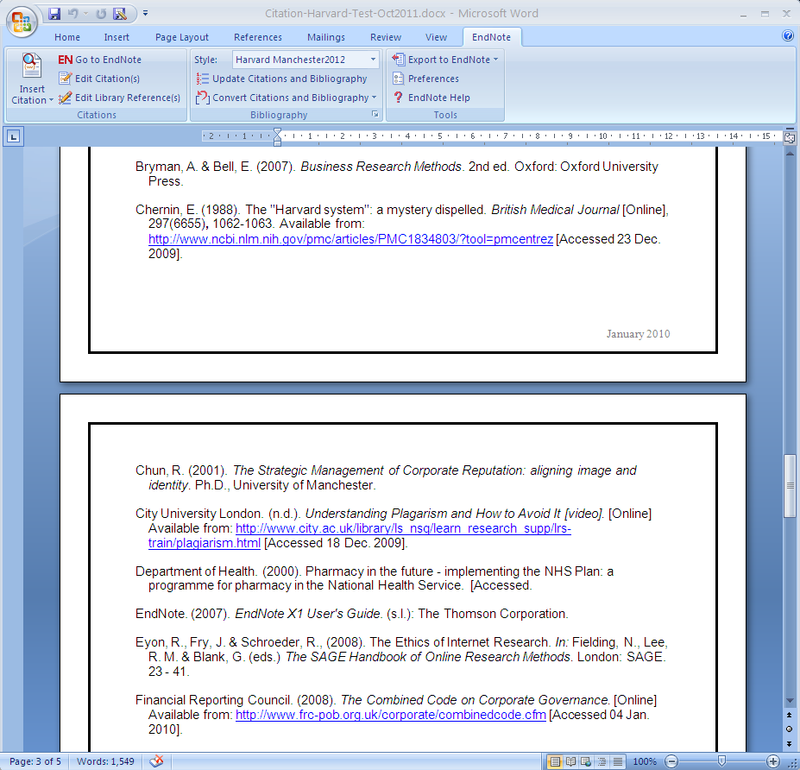 The information about Harvard citation style was getting rather long, so collected it into a draft document. This tries to explain why using Harvard referencing is harder than you might think, particularly when using EndNote. 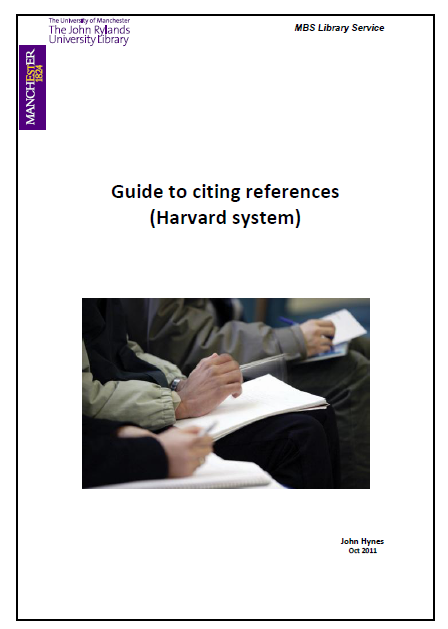 Please leave a comment if you find Harvard referencing and EndNote useful. Revised answers on Harvard style and citation in general. How do I find information about Harvard citation style? How do I cite references to electronic resources? How do I choose a citation style? The available resources seem to be either too brief to address all the basic queries, or too long for a first guide to referencing. The fact that different sources describe variations on the Harvard style makes it hard to keep things simple.